Create lasting memories, one moment at a time. Are you visiting St. Louis, Missouri and looking for fun activities for the kids in your life? You should really check out Faust Park and the St. Louis Carousel. With the Sophia M. Sachs Butterfly House also on the grounds, the St. Louis Carousel at Faust Park is a great place to spend an afternoon whether you’re just visiting the area or you actually live here. (Sometimes the place you live is the last place you explore.) Don’t miss out on this one! Here are some details about the place to help you decide if it’s right for you and your gang. St. Louis Carousel at Faust Park is a treasure that remains hidden in plain sight. In searching for unusual, fun activities for kids in the St. Louis area, I ran across this gem. Maybe some of you are familiar with the St. Louis Carousel, but I have been in the St. Louis area for many years and had never been there. For those like me who are unfamiliar with it, I wanted to share this with you. As an Amazon Associate and a participant in other affiliate programs, Passing Down the Love earns a small commission from qualifying purchases at no additional cost to you. See full disclosure here. Kids of All Ages – 0-100. Tuesday – Sunday: 10 a.m. – 4 p.m. Rides are $2/person or $5 for three rides. Children under 1 are free with a paid adult. Please verify hours and cost before you go. Visit the St. Louis Carousel page at the St. Louis County Missouri’s Parks & Recreation website. The heyday of the Carousel in America was between 1880 and 1920. In those years, skilled craftsmen hand carved realistic and sometimes highly imaginative animals and decorative pieces for the Carousels. The St. Louis Carousel is an original, designed and built in the 1920’s by the Dentzel Co. of Philadelphia. The Carousel was originally installed at the St. Louis Highlands Amusement Park in 1929. A fire in 1963 destroyed the amusement park. The Carousel, not harmed, was then purchased by St. Louisan, Howard C. Ohlendorf and donated to the St. Louis County Department of Parks and Recreation. The Carousel was moved to Sylvan Springs Park where it remained until 1979. Seeing the deterioration of the carousel and wanting to preserve it for future generations, the St. Louis County Historic Buildings Commission and the Faust Park Foundation raised funds to restore the Carousel and moved it to Faust Park. The Carousel was opened in its present building at Faust Park on May 9, 1987. 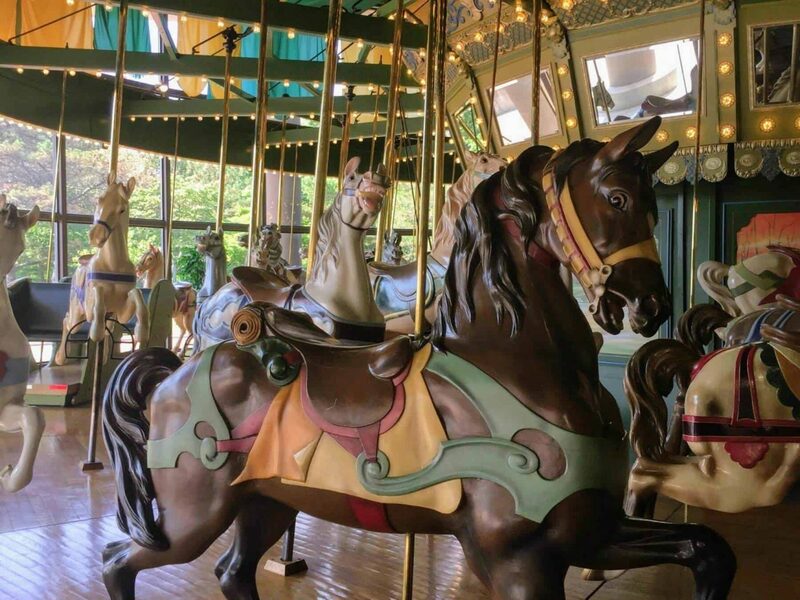 A not for profit corporation, the Faust Cultural Heritage Foundation, was formed to raise funds and other forms of support for the Carousel’s continual maintenance and restoration. Today the St. Louis Carousel in Faust Park is open to the public. The St. Louis Carousel features 60 ornately carved horses and four deer. The carousel is housed in a climate-controlled, indoor building allowing for visits in any kind of weather – whether to escape a steamy hot Missouri day, a rainy afternoon or a cold, blustery winter. How great is that? (Really, anytime is a great time for a carousel ride!) Being indoors also helps to protect and preserve the carousel for future generations to enjoy. For a small fee, you can climb aboard your favorite horse and take a spin on this historic Carousel. This is a unique, delightful experience fitting for many occasions. Rent the space for your children’s birthday party. Unique and Fun Things To Do With Kids in St. Louis, MO. The St. Louis Carousel has a gift shop which carries unique carousel related gift items, t-shirts, books, water globes, music boxes, postcards, balloons and children’s toys. The Gift Shop also sells goodie bags which are perfect for children’s birthday parties. Become a St. Louis Carousel member and receive the benefit of riding FREE for an entire year. All memberships include 10% off all Gift Shop purchases over $10. Family memberships begin at $80. Call (314) 615-8345 for more information. The St. Louis Carousel is a special place, for sure. With temperatures in the high 90’s and the Missouri humidity this week, the indoor fun was a welcome relief! Climbing up on the horse will stir memories of your childhood. We enjoyed the vintage organ music, the enchanting atmosphere, and the magical feeling surrounding us. The carousel’s artistically beautiful workmanship, the St. Louis history displayed, and the nostalgia we felt – it all was amazing. The picture perfect setting in Faust Park is icing on the cake! Take a trip to visit the St. Louis Carousel – I’m sure you’ll have a delightful time! Whatever the occasion, or no occasion at all, the St. Louis Carousel is a fun thing to do with kids in St. Louis, MO. Make memories on the Carousel, Passing Down the Love. To keep up with us and hear about the interesting places we are visiting, please follow me! I’d love to take you along! If you’d like to know about other places we’ve been, you might enjoy Myseum: Kid Friendly Fun in the St. Louis area or check out some of our other recent posts below. You know, Sharing is Caring. If you like this post, please share with your friends on Facebook, Pinterest or Twitter. Thanks for your support! Just for you - a list of 50+ Activities you can do together. Have fun with your Grandkids! If that isn't enough, get access to our exclusive "Members Only" area, too! « Myseum Review: Kid-Friendly Fun in St. Louis, Missouri.